One Bite with a Stranger is subtitled ‘The First Book of the Others’ and as the author reveals on her website is actually an expanded version of her first paranormal romance novel Fantasy Fix (Pub. Ellora’s Cave). This is the classic supernatural creature (vampire) meets fated mate story with the traditional HEA. The cover synopsis pretty much sums up the story except for a minor subplot involving Dmitri investigating illegal vampire turnings which adds a couple of action scenes and is quickly resolved. The main ‘thrust’ of the story is the love story between Reggie and Dmitri. The erotica factor is pretty high—the first love scene lasts 4 chapters and 64 pages. Overall this was a quick and pleasant paranormal romance read. However, having read all of the previous novels in the Others series, I would have to say that One Bite with a Stranger adds very little to the Others cannon. 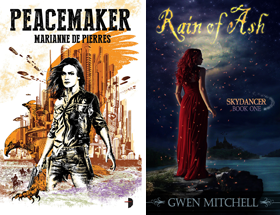 If you have not read an Others novel I would encourage you to start with one of the more recent titles, all of which deliver a more sophisticated and engaging urban fantasy layer with the paranormal romance. The next Others novel will be out next year and is called You’re So Vein. Great title. Read an excerpt from Chapter One. Thanks Kimberley. The Others stories are always good romances.